Have you arranged work experience for your medical application? If so, great! Maybe you’ve got something in a hospital, or a GP office, where you’ll see actual doctors practice on actual patients! That’s fantastic. Unfortunately, it won’t matter at all unless you know how to use it. At Applican, our core message is that it doesn’t matter WHAT experience you manage to get, it is about HOW you use it and what you learn! Maybe you’re in for an afternoon; maybe you’re in for a fortnight. Maybe you didn’t manage to get that kind of specific work experience - you missed out on the available slots and didn’t have any contacts. It happens to lots of people, and it’s okay! You can make your non-clinical work experience just as relevant. Volunteering in a care home, or hospice, or with children, and all your other employment and voluntary work can all be more than enough, if you use them correctly. You’ve probably heard that work experience is more about what you learned than what you did a thousand times, but it’s really true. 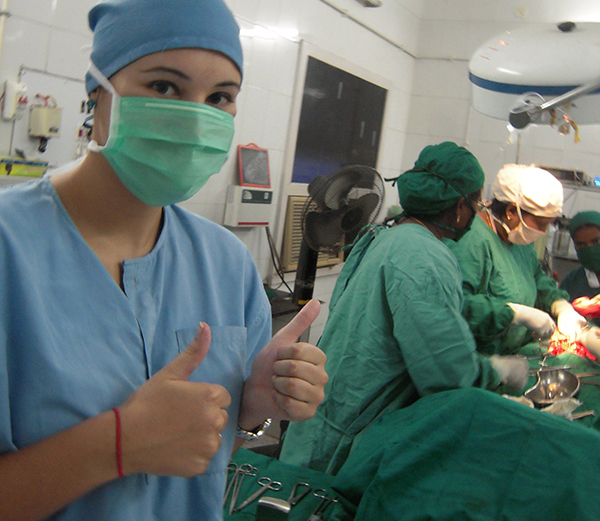 Here are 10 top tips to make your medical work experience matter. Although clinical experience often isn’t necessary, it’s still helpful to your application and you should make an effort to try to find opportunities. If you aren’t able to get any, redirect that effort into making sure you have a variety of other useful experience that has allowed you to build skills like teamwork and communication, and characteristics like empathy. Then do a whole lot of research yourself into the career of a doctor! Medical schools don’t just want you to know what you’re getting in for, and have the required skills, they want to know that you want this. Showing motivation is vital in a medical application, so get motivated and put in the work. Medical schools want you to have sought and undertaken some form of experience (or at least research!) to widen your understanding of a medical career. Applying to medical school is both a university and a job application, and they want to know that everything you know didn’t just come from Grey’s Anatomy (the TV show, not the textbook!). Therefore, if you do work experience and zone out the whole time, or let the staff pass you by without talking to them, then you may as well have spent the day at home. One way to avoid this is to write a list of questions out before you go into your placement. What do you want to know? How can you expand upon what you’ve already researched? Ask doctors about their jobs, about what their time at medical school was like, what their normal days involve. This doesn’t mean have a list of questions held in front of you as you grill some unsuspecting consultant! Just use the list to make sure you’ve thought about what you want to know, and maybe check it half-way through the day (alone!) to see if you’re on the right track. Work your questions in when it’s appropriate. Teamwork is an important aspect of being a doctor, and this includes working in multidisciplinary teams with other healthcare professionals like nurses, pharmacists, nutritionists and physiotherapists. You should definitely be trying to find out what work is like for other members of this team, and understand the role that everyone has to play. Obviously, this is within reason - don’t interrupt a busy nurse as he’s trying to do his job! This teamwork aspect is why it’s also great to talk to people in other caring environments like homes for the elderly. It’s very important to know about the negative aspects of working as a doctor as well as the positive ones. So ask doctors what they like about their jobs, and what they don’t like! You can also discuss this with other professionals who work in a caring role. This is not only to show that you have a thorough understanding in your personal statement or interview, but also to help you decide if this is the career for you! There is no point in watching some aspect of a healthcare professional’s work if you don’t understand what they’re doing or why they are doing it. Whenever you don’t know something, it’s an opportunity to learn. Most people will be happy to explain things to you, as long as you are polite, enthusiastic, and catch them at the right time! Being a doctor isn’t all performing surgery and taking histories - there is a lot of other work that needs done, including administrative work, prescribing and discussion with colleagues. It’s good to know about all aspects of the job you want, not just the “exciting” bits. Before I go any further with this tip - you must ALWAYS be careful about patient confidentiality. Never write down anything that might identify a patient. This doesn’t just mean avoiding referring to them by name, but can include details like age, ethnicity, where they are from… Besides, the patient specifics aren’t what are important to your work experience! With that said, it would be a real shame if all of your efforts in getting work experience and all of the excellent questions you asked were to go to waste because you forgot what happened! When you get a spare moment, or maybe just after you leave your placement for the day, write down things that you have seen and learned. Note what you feel, what surprised you, what you enjoyed and didn’t enjoy! It will all come in handy later. After your work experience is over, set a writing target for yourself, such as 400 words. Then sit down and reflect on everything you experienced. Again, be mindful of confidentiality, but this should be more about your thoughts and feelings on a medical career. Reflection is part of being a medical student and a doctor - throughout your career you will be asked regularly to reflect on your studies and practice, so it’s a good skill to start learning. Be honest - what thing about my week put me off this career? If you are going to write about your work experience in your personal statement and talk about it at interview (and you are!) then this is the best way to get your head around what everything you saw means and how it has helped you. You should relate it to your other experiences and skills (for example, you saw a doctor display leadership, and you learned to be a leader as captain of your Korfball team) and your knowledge of medical ethics (for example, you saw a patient waiting for a liver transplant, and you have read about the ethics of transplant allocation). Some medical schools like Bristol may ask for specifically medical work experience for a prescribed length of time. These are exceptions, rather than the rule. If you have a fortnight or more of work experience in a medical setting, maybe that would be an advantage in applying there! If you don’t, there are plenty of medical schools with less stringent requirements. It is totally reasonable to think about which medical schools you want to apply to based on whether or not you have a chance of getting in - applying where you won’t be accepted is a waste of everyone’s time! That said, make sure you’re also applying to places you want to live in, and courses you want to study. DON’T call up the admissions department and ask whether you’ll get in, as this is not looked upon favourably! All the entrance requirements should be available to you somewhere. They’re doing you a favour!